A new version with additional Amiga modes, updated HAM6 conversion and a simple palette editor. Updated user interface by adding tabs with log and options. Added 4, 8, 64, 128-color Amiga indexed modes (including iff saving). New experimental completely CIEDE-based ham6 conversion algorithm. Set/modify variant is chosen based on the ham error from the current and the next pixel for more efficient error distribution and more regular and less unnatural looking artefacts. It’s an early version that can produce some glitches (mostly with bright reds when there are no real reds in the palette). 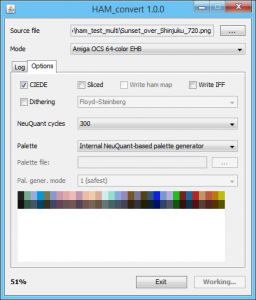 A simple palette editor to manually adjust palette entries. Useful in reducing ham artefacts (by adding some reds). 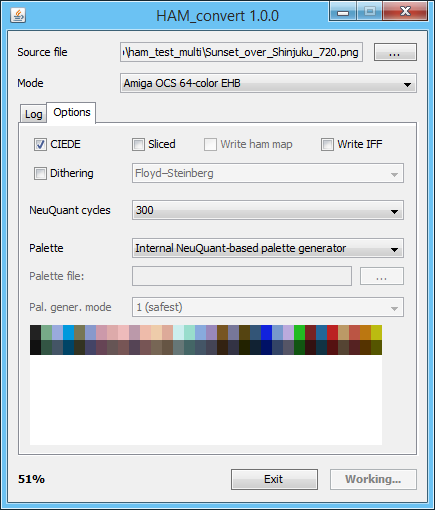 Internal palette generator: place the darkest color in the first palette entry (border color). This entry was posted in Computers, ham_convert, Java, Personal blog, Retro equipment and tagged Amiga, HAM, ham_convert, HAM6, HAM8, Hold-And-Modify, iff, java, neuquant by mrsebe. Bookmark the permalink.